In my age group, past my late 50’s, there are very few of my intimates, friends and associates, me included, that have not been through the confusion and pain of losing someone close to us, someone who, most likely unawares, served as an internal compass … whether we liked it or not. 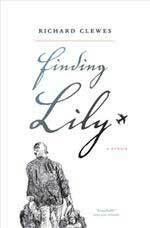 “Finding Lily” by Richard Clewes is a must read. The author’s website is an intriguing insight into the style of the book. Shocked? Confused? Perhaps, even a little horrified that anyone could look at grief with gratitude? Well, you won’t be once you’ve finished the book. I recommend taking your time re-reading pages and paragraphs that speak to you about your own grief and loss. I found mine, many times over, sometimes embedded in humor, sometimes in Clewes’ deeply-felt narrative. The book is artistic and accessible, small at a mere 189 pages but gigantic in proportion to the author’s honesty in the face of the grieving process, particularly in the aftermath of suicide. The style initially appears commercial and clever, even contrived, a unique twist with a marketing advantage, but not so. After his wife takes her own life, the author stops working, abandons the safe confines of a familiar life and launches himself on a three-month trip around the world with not much more than his sorrow, bewilderment, diary, pen and sketchbook. Clewes records his sojourn in both words and illustrated postcards, which he mails to himself along the way … and ultimately, he finds Lily in Queenstown.